During the 15th and 16th centuries, Spaniards started undertaking long voyages in order to find new places for the Spanish Empire to colonise. Most of these voyages were undertaken by Spanish explorers hoping to make a name and fortune in their attempts. Christopher Columbus’ success in finding the New World encouraged many such explorers. Among these was Hernan Cortes, the Spanish explorer under whose leadership the Spanish troops reached Mesoamerica and defeated the might of the Aztec Empire. Spanish explorers reached the Aztec Empire in 1519 and by 1521 the last strongholds of the Empire had been conquered. The expedition that led to the Spanish conquest of the Aztecs was marked with a lot of hiccups even before it began. Originally, the exploration of Mesoamerica, which included both Mayan and Aztecs regions, fell under the domain of the Cuban governor Diego Velazquez. Hernan Cortes was Velazquez’s brother-in-law and he was given the charge of exploring the Mexican coast. Being among the earliest explorers of the region, Cortes was specifically charged with forging trade ties with the people of the region. 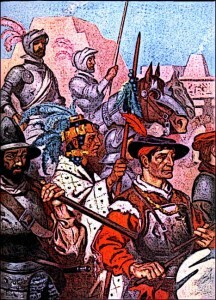 Hernan Cortes arrived at Tenochtitlan with his troops in November 1519. He was welcome by the Emperor, Moctezuma II, and was invited to the palace as a guest. Although Hernan Cortes was given the commission to take the expedition to the Mexican coast and explore the interior regions as well, the Spanish troops resented this. It was expected that whoever undertook the expedition would be able to amass wealth and fame by discovering new lands. The original commission given to Cortes by Velazquez was to simply explore the area and create trade ties with the natives. Cortes was asked not to engage in any fighting with the locals. Hernan Cortes was very well-versed in the legal intricacies of the Spanish colonial law. He convinced Velazquez to insert a dubious clause into his commission which gave him broad-ranging powers. The clause essentially allowed him to undertake any unexpected actions or campaign which was in the true interests of the realm. Cortes was later able to use precisely this tiny clause to give legal justification for his campaign in the Aztec lands and his conquest of the Aztec Empire. Although Cortes was making preparations for his expedition, Velazquez realised that he intended not simply to explore the Mexican coast and the adjoining regions but also to vanquish them. Velazquez wanted to use Cortes to clear the way so that he could later take his own expedition to the region and win glory by defeating the locals and bringing the region under the Crown’s control. Cortes, however, had his own plans and wanted the glory and victory to be his. When Velazquez realised this, he cancelled the commission. However, Cortes continued his preparations unabated. Velazquez also tried to have Cortes arrested but Cortes defied all such moves and was not in the mood to quit after his extensive preparations. Cortes was able to salvage 11 ships for his trip. On these 11 ships were a total of 630 fighting men along with many skilled personnel such as carpenters and a doctor. The group also included hundreds of freedmen and slaves of African and Cuban origins. Of the fighting men, 30 were crossbowmen. The group also had 12 rudimentary types of firearms, something which later proved very instrumental in subduing the natives of the Mexican region. Hernan Cortes and his group landed on the Mexican Coast at the Cozumel Island region. In the adjoining region of Yucatan, some previous Spanish vessels had shipwrecked and two of their survivors lived under a Mayan lord. Cortes sent word for them and was joined by one of them, namely Geronimo de Aguilar. Aguilar had learnt a number of indigenous languages since his arrival in Yucatan and he proved very helpful in Cortes’ later conquest of the Aztec lands. Hernan Cortes, one of the Spanish explorers, undertook an expedition to the Mexican Coast in 1519. After Cozumel, Cortes led his expedition to the mainland of the Yucatan Peninsula. Here was able to subdue the local population and met La Malinche, the woman who played a central role in Cortes’ conquest of the Aztec Empire. La Malinche was able to translate from Mayan to the Nahuatl language of the Aztecs, and Aguilar translated from Spanish to Mayan. Together with these two, Cortes was finally able to communicate his messages to the Aztec natives. Cortes set down his expedition at the site where modern-day town of Veracruz stands. A number of ambassadors from the Aztec Emperor, Moctezuma II, went to meet and bore him a number of gifts. Cortes created a proper administrative structure at Veracruz and began building the town. At the same time, he was able to muster the support of a local Totonac population. Cortes persuaded them to rebel against the Aztecs, taking Aztec officials in the locality as prisoners. The Aztec Emperor sent more gifts of gold and other lavish items to have his officials freed. The gifts incited the Spanish explorers towards the riches of the Aztec capital, Tenochtitlan. Hernan Cortes arrived at Tenochtitlan with his troops in November 1519. He was welcome by the Emperor, Moctezuma II, and was invited to the palace as a guest. 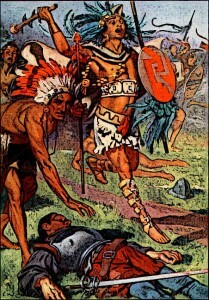 In the meantime, the Aztecs attacked and killed many Spanish soldiers that were left by Cortes on the coast. Upon hearing of this, Cortes took Moctezuma II prisoner in his own palace and began ruling through him. Cortes had to briefly leave the city and in his absence, the Spaniards led a massacre which caused an open rebellion against them. They had to fight their way out of Tenochtitlan, incurring many casualties. Cortes soon returned to the city and laid siege to it. The city fell to Spanish hands in August 1521, marking the end of the Aztec Empire. Hernan Cortes, one of the Spanish explorers, undertook an expedition to the Mexican Coast in 1519. Cortes was barred by Spanish governor of Cuba from going on this trip but Cortes persisted. He reached the Yucatan Peninsula and from there, marched towards the Aztec lands. On his way, he found local translators and allies, bringing many cities and tribes to his side against the Aztecs. Finally, he reached the heartland of the Aztec Empire in 1519. By 1521, Cortes had subdued the Aztec capital of Tenochtitlan and conquered the entire Aztec Empire.